Quick, easy, and cheap to make, kimchi bokumbap is simple Korean home cooking at its best. 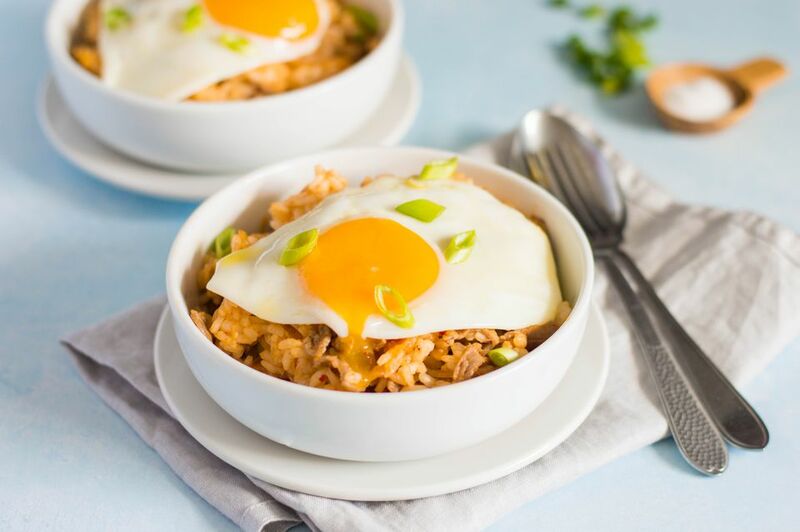 Kimchi fried rice (bokumbap or bokkeumbap) makes for a simple meal that helps you use two items commonly found in Korean pantries and refrigerators—rice and kimchi. This recipe is humble food that is mostly enjoyed at home, but you might also see it in some casual Korean eateries. Using kimchi that's made with Napa cabbage is a good choice for this recipe, and making kimchi fried rice is a great way to use leftover kimchi that's a bit past its prime and sourer than fresh kimchi. It is actually what helps make this dish special. Most Koreans enjoy kimchi every day of the year. Kimchi is rich in vitamins and minerals and makes for an extremely healthy food choice. Sauté kimchi and onion in a lightly greased large pan over medium heat for a few minutes. When vegetables begin to look transparent, add garlic, soy sauce, and 1/2 tablespoon of the butter; sauté for another 2 to 3 minutes. Add the meat and continue to sauté until meat is cooked. Turn heat off, but keep the pan on the burner. Add the cooked rice and the rest of the butter, mixing to combine. Salt to taste and top each serving with a fried egg. Instead of beef, you can use pork, ham, bacon, Canadian bacon, or even Spam. If using American bacon, first sauté briefly in a large un-greased pan and omit the butter when adding the garlic and soy sauce. Some recipes for Kimchi fried rice use chicken or baby shrimp as the protein source, so don't be afraid to experiment once you've got the basic recipe mastered. Kimchi fried rice can also be made vegetarian by substituting tofu squares for the pork, beef, chicken, or shrimp.